Fastest JVM (Java/Android/Scala/Kotlin) JSON library with advanced compile-time databinding support. Compatible with DSL Platform. Java JSON library designed for performance. Built for invasive software composition with DSL Platform compiler. DSL can be used for defining schema from which POJO classes with embedded JSON conversion are constructed. This is useful in large, multi-language projects where model is defined outside of Java classes. More information about DSL can be found on DSL Platform website. Annotation processor works by analyzing Java classes and it's explicit or implicit references. Processor outputs encoding/decoding code/descriptions at compile time. This avoids the need for reflection, provides compile time safety and allows for some advanced configurations. Processor will register optimized converters into META-INF/services. This will be loaded during DslJson initialization with ServiceLoader. Since v1.8.0 naming conventions will be used for Java8 converters (package._NAME_DslJsonConverter) which works even without loading services upfront. Converters will be created even for dependent objects which don't have @CompiledJson annotation. This can be used to create serializers for pre-existing classes without annotating them. Since v1.7.0 DSL-JSON supports compile time databinding without Mono/.NET dependency. It provides most features and flexibility, due to integration with runtime analysis and combining of various generic analysis. Bean properties, public fields, classes without empty constructor, factories and builder patterns are supported. Package private classes and factory methods can be used. Array format can be used for efficient payload transfer. DSL Platform annotation processor requires .NET/Mono to create databindings. It works by translating Java code into equivalent DSL schema and running DSL Platform compiler on it. Since v1.7.2 Java8 version has similar performance, so the main benefit is ability to target Java6. Bean properties, public non-final fields and only classes with empty constructor are supported. Only object format is supported. Collections can be used on supported Java types, other POJOs and enums. Java8 supports all kinds of collections, even maps and Java8 specific container such as Optional. @JsonConverter which implements Configuration will also be registered in META-INF/services which makes it convenient to setup initialization. All of the above custom type examples work out-of-the-box in Java8 version of the library. hashMatch - DSL-JSON matches properties by hash values. If this option is turned off exact comparison will be performed which will add minor deserialization overhead, but invalid properties with same hash names will not be deserialized into "wrong" property. In case when model contains multiple properties with same hash values, compiler will inject exact comparison by default, regardless of this option value. Java8 version supports converting enum as custom value. To use such feature @JsonValue annotation must be placed on method or field. Formatted output with alignments and newlines can be created via PrettifyOutputStream. Those annotations will be translated into specialized DSL for specifying serialization name. Ignored properties will not be translated into DSL schema. Best serialization performance can be obtained with combination of minimal serialization and minified property names/aliases or array format. Object and array formats can be combined. POJO can support both formats at once. Core library (with analysis processor) and DSL Platform annotation processor targets Java6. Java8 library includes runtime analysis, reflection support, annotation processor and Java8 specific types. When Java8 annotation processor is used Mono/.NET doesn't need to be present on the system. Android can use Java8 version of the library even on older versions due to lazy loading of types which avoids loading types Android does not support. JsonWriter can be reused via reset methods which binds it to specified target. When used directly it should be always created via newWriter method on DslJson instance. Several DslJson serialize methods will reuse the writer via thread local variable. When using JsonWriter via the first mode, result can be copied to stream via .toStream(OutputStream) method. For small messages it's better to use byte API. When reader is used directly it should be always created via newReader method on DslJson instance. JsonReader has iterateOver method for exposing input collection as consumable iterator. Also, since v1.5 binding API is available which can reuse instances for deserialization. DSL-JSON works on byte level. To discourage use of String for JSON processing there is no high level String API. If one really needs to use String, manual conversion is required. libraryDependencies += "com.dslplatform" %% "dsl-json-scala" % "1.9.3"
Q: What is TContext in DslJson and what should I use for it?A: Generic TContext is used for library specialization. Use DslJson<Object> when you don't need it and just provide null for it. 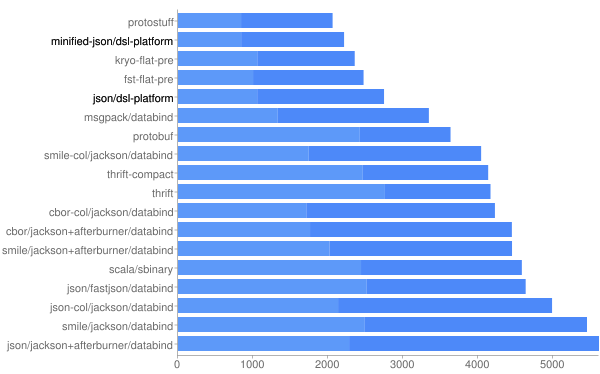 Q: Why is DSL-JSON faster than others?A: Almost zero allocations. Works on byte level. Better algorithms for conversion from byte -> type and vice-versa. Minimized unexpected branching. Reflection version is comparable with Jackson performance. Extra difference comes from compile-time databinding. Q: DslJson is failing with unable to resolve reader/writer. What does it mean?A: During startup DslJson loads services through ServiceLoader. For this to work META-INF/services/com.dslplatform.json.Configuration must exist with the content of dsl_json_Annotation_Processor_External_Serialization or dsl_json.json.ExternalSerialization which is the class crated during compilation step. Make sure you've referenced processor library (which is responsible for setting up readers/writers during compilation) and double check if annotation processor is running. Refer to example projects for how to set up environment. As of v1.8.0 Java8 version of the library avoids this issue since services are not used by default anymore in favor of named based convention. Eclipse is known to create problems with annotation processor since it requires manual setup (instead of using pom.xml setup). For Eclipse the best workaround is to build with Maven instead or relying on its build tools.